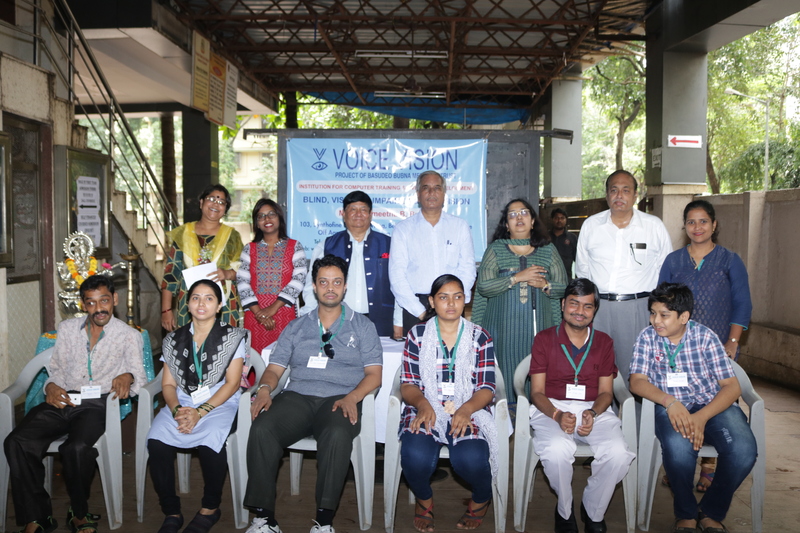 Voice Vision in association with the Lifesupporters Institute of health sciences, organized one of its kind workshop on first-aid and self safety specially designed for the people across disabilities on Sunday, June 10, 2018 at Prahladrai Dalmia Lions College, Malad (W). This kind of a workshop has been conducted for the first time in India for the benefit of persons with disabilities. Titled ‘The First-Aiders Training for Disabled’ was a great success. The event began by welcoming everyone with an auspicious Inauguration ceremony by lighting the lamp and continued till breakfast. The training workshop commenced at 9:45 am and went on till 5:30 pm, being a day long workshop with an equal mixture of theoretical explanations and practical demonstrations. It gave the people with disabilities an overview of what should or should not be done in various situations such as epilepsy, fainting, dehydration, breathing problems, bleeding, applying bandage, fractures, burns, snake bites, cardiac attacks, etc alongside hands-on experience of preventing bleeding, applying bandage, CPR and allied. In order to make this training more effective, the trainers and volunteers were subjected to a small sensitization workshop conducted by the members of Voice Vision, a week prior to this event, which equipped the trainers and volunteers to get familiarized with the basic ways and techniques to address people with varying disabilities. The Lifesupporters’ team of trainers and volunteers made special modifications to accommodate practical demonstration wherever necessary for optimum understanding of the techniques by disabled. They also focused on providing attention to every participant, thereby making their experience of learning more value-driven. This training program granted a sense of empowerment and self-efficiency to people with a great diversity in disabilities. This was done with a vision to create an inclusive platform by bringing different disabled people together and creating an opportunity for them to experience the efficiency and wide range of possibilities in handling same situations. All participants, volunteers and doctors found this workshop to be completely educational and resourceful. This event captivated 90% of the participants and it also proved to be successful in generating self-efficiency among them. Doctors’ interaction, method of imparting knowledge through practical demonstrations appealed 89% of the participants. 80% of participants were totally satisfied with the help provided by the volunteers. This workshop, as a result, gathered positive remarks from all those who were present.